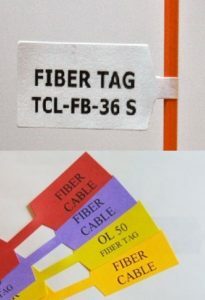 Our optical fiber tag TCL-FB-36 labels use a simple and innovative design and can be printed on any standard office laser printer. Our Technicians use these labels that ensure, you can also remove them without harming the fiber cable. Our optical fiber flag/tag labels are easy to use and can be printed in any standard office laser printer and our new easy to use web-based printing software. The Fiber tags are also very easy to remove our engineers requested this after many installations the tags became too hard to remove the old tag and we did not want to damage the fiber cable. Only currently printable in a word template we have had great results with these fiber tags on our installations. We have colors in stock. Our Optical fiber tags TCL-FB-36 labels use a simple and innovative design and can be printed on any standard office laser printer. Our own Technicians use these fiber labels every project. If you are labeling something that requires durability and moisture protection, try our waterproof labels. We have the perfect multi-use, a durable label for your next project. Our weatherproof labels are ideal for labeling outside fiber MDF and any fiber products, or many cabling uses that might get exposed to liquids or heavy use. It’s also perfect for outdoor label applications.